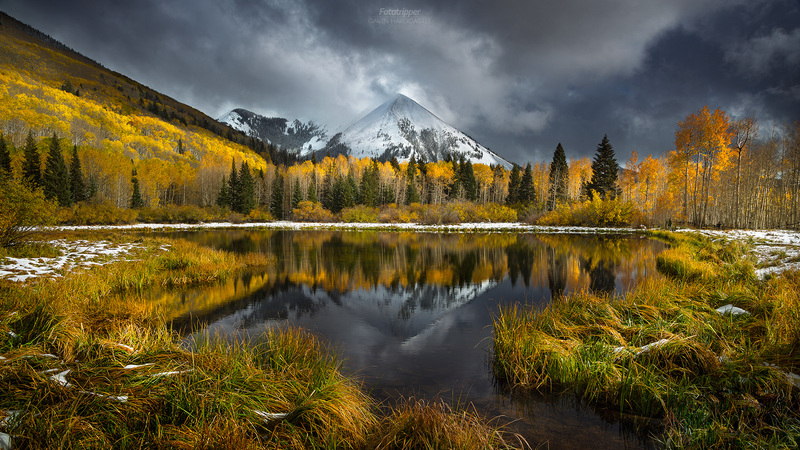 I really have to thank my fellow countryman Thomas Heaton for inviting me out to shoot in the La Sal foothills. In all my years of shooting in Moab I’d never ventured into the foothills. I simply had no idea that such a gem was waiting for us just a 45 min drive from town. When we first showed up, the mountain was completely obscured by cloud so we walked right passed this scene without a second glance. We headed off higher up the mountain only to be turned around by a sudden dusting of snow. When we got back to the lake things looked much more interesting and pretty much all of our entire group ended up shooting this lovely reflection. The clouds were moving very quickly and so the aspens on the hill would be partly aglow and partly in shadow. I love that kind of dynamic light so I took almost 100 frames to ensure I captured the perfect moment. Gorgeous shot! Would love to see how you post processed this. Well done Gavin!